There are a number of applications such as bright dipping, passivation and washing/etching of substrates wherein the use of an acidic chemical is required. 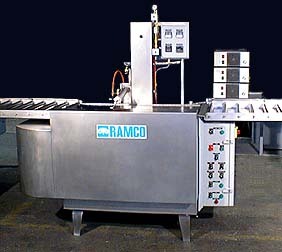 Ramco has engineered and constructing a number of immersion processing systems for use with phosphoric, oxalic, citric and nitric acid. The case history below is one of several systems built in the late 1990s for a major manufacturer in the electronics industry. The function is for the removal of tenacious residues from the substrate of components used in the process. The line runs right to left. 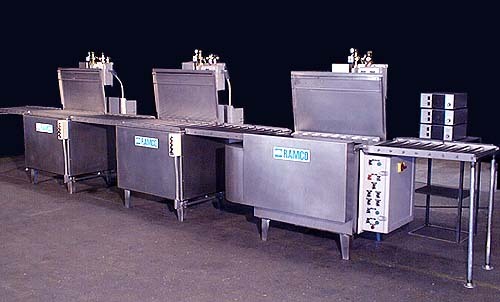 The system consists of three immersion washers that can batch process components in a 34″ long x 20″ wide working zone with a gross weight of 150 pounds. The washing station is built of nickel-chromium-molybdenum alloy stainless steel suitable for the acid to be used. The inside tank surfaces and ultrasonic immersibles are passivated. The wash station uses platform oscillation with powerful sweep frequency ultrasonics and a turbo/filter. 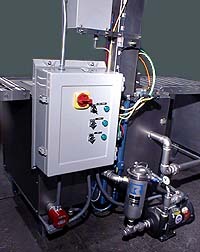 A lip vent exhaust system is provided on the acid wash station. It is engineered for 200 cfm per square foot of opening and designed to come on as the cover opens and shut off as the cover closes. A slotted vent and large plenum extends across the front of the processing chamber and terminates at the rear with a tubular axial fan. Positive mechanical ventilation designed to limit the accumulation of chemical vapors makes the system safer when the cover is open. Furthermore, limiting the spreading of chemical vapors from the surface of the solution to the surrounding area lessens any hazard to the immediate environment. 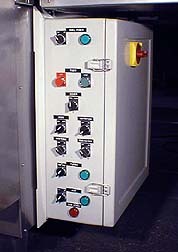 Automatic opening/closing covers are provided for each station. The system is built in accordance with Nema 4X electrical standards (water proof and corrosion resistant) including the control panels, switches, pilot lights, lockout-tagout disconnect switches and wiring. Stainless steel is used for all the insulation panels, guards, mounting brackets and legs. Platform roller conveyors are included on each elevator and in between stages to facilitate transfer between stations.